Description - Bring the gym home with Body-Solid's EXM3000LPS Home Gym. With the ability to work out your whole body with one machine, you are certain to achieve your beach body in no time. This home gym features 7 exercise stations and is backed by a lifetime residential warranty. Multi-Press Station: Built to deliver strength- and deliver it does! 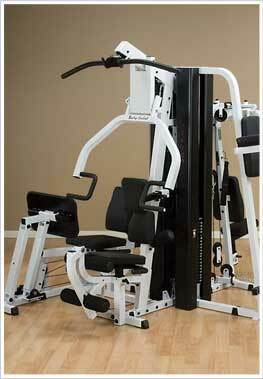 Three stations in one with fully adjustable pads for all size users and a full range of motion exercise. Structurally and biomechanically designed for maximum chest, back and shoulder concentration. Leg Press/ Calf Press Station: It' s Included! Unique two bar linkage self-aligns the angle of the leg press plate to the user' s body eliminating ankle torsion and ensuring proper biomechanics throughout the full range of motion for all size users. Includes pillow block and sealed ball bearings for precision alignment and friction-free movement. 2:1 ratio converts the 210 lb. weight stack into 420 Lbs. of resistance. Features adjustable back pad with two position press plate for complete leg and calf development. Ab Crunch / Mid Pulley Station: Create a lean and muscular waist with absolute isolation of your abdominal and oblique muscles. The unique design also allows the highest degree of comfort when doing triceps extension movements. Dual 210 Lb. Alloy Steel Weight Stacks: Two weight stacks that employ state of- the-art nylon bushings for super smooth and quiet operation. DuraFirm™ Pads: Durable, tear-resistant, fully supported DuraFirPads are double stitched and sewn. This high density, top grade pads provide a LIFETIME of support and comfort and will not bottom out or wear out ... GUARANTEED ! Weight Stack Shrouds: Two full lengths, solid steel shrouds entirely encompass each weight stack for enhanced appearance and improved safety. Recommended For - Body-Solid's EXM3000LPS Home Gym is the total full body workout experience every home gym needs. With 7 workout stations tochoose from, you will never find a need to go to the gym. Great for home or commercial gyms. Dual 210 lb. alloy steel weight stacks. Don't workout alone. Great for multi-users. Body-Solid's EXM3000LPS Home Gym is the ultimate home gym and has 7 stations that will work your whole body. No need to go to the gym when you have everything at home in one easy to use machine. The stations that come with this piece of fitness equipment are a Multi-Press Station, a Leg Press/Calf Press Station, a Perfect Ped Station, a Lat Pulldown/High Pulley Station, an Ab Crunch/Mid Pulley Station, Leg Extension/Leg Curl Station, and a Seated Row/Low Pulley Station. This home gym comes with dual 210 lb alloy steel weight stacks, DuraFirm Pads, and weight stack shrouds for improved safety. Workout your whole body with Body-Solid's EXM3000LPS Home Gym. With 28 exercises that can be performed on this fitness equipment, you will be able to work out the following muscles: Abs, Biceps, Delts, Lats, Obliques, Pectorals, Quads, Shoulders, Traps, and Triceps. Body-Solid's EXM3000LPS Home Gym is commercially rated. The warranty for light commercial use is as follows: Lifetime on the frame and welds, 3 years on the pulleys, bushings, bearings, hardware, plates, and guide rods, and 1 year on the cables, upholstery, and grips. For residential use, the warranty is as follows: Lifetime warranty on the frame, welds, pulleys, bushings, bearings, hardward, plates, guide rods, cables, upholstery, and grips. Need some added weight or think it would be nice if you could add a few more workouts to your new home gym? Then feel free to add accessories. Some add-on options for this home gym are a vertical knee raise attachment, 2.5 and 5-pound weight stack adapter plates, a triceps rope, and an adjustab nylon stirrup handle.